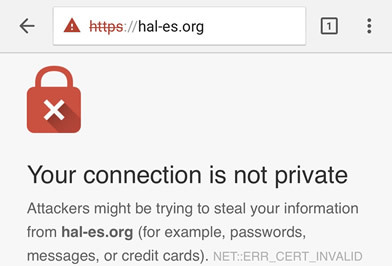 HAL-ES | My connection isn't Private? What?! In the interest of keeping your information secure as well as keeping traffic between users and our servers safe, we constantly update our SSL Certificates. Depending on the situation, we may implement the new certificate immediately, or we may wait to deploy the certificate. Sometimes when we need to start using the new certificate IMMEDIATELY, your device may say that your connecton isn't private PICTURED BELOW. This is temporary and usually, will self-resolve within a few hours. We understand that this may cause iconveniences. Due to this, we try to perform updates during off-peak hours. However: This may not always be possible.